Annie is a smart horse trainer, and an even smarter columnist for Montana Living. She writes about things she knows - horses and the owners who love them. She also juggles supporting her sister - who is going to college and raising a young son. Life is in control - a tight control - but in control for Annie. Then a change with her publisher turns her "safe" column into a new venture - one that focuses on love and relationships. Annie ends up trading help for Dylan's sick horse, Bravehart, for his help answering the readers letters. Soon Annie finds her tightly held control (on her love life and her relationship with her sister) slipping away - and she is left wondering what will be changed in the name of love. 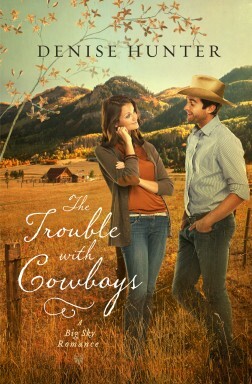 In The Trouble With Cowboys, Denise Hunter has created an interesting novel - with lots of layers. On the one hand, the story focuses on the relationship (and the subsequent struggles) between Annie and Dylan. On the other, it unpacks the changing relationship Annie and her sister, Sierra, as they move from "caregiver/child" to adult siblings - both exploring new and changing careers. In all, this is a good read. It's solid, interesting and fun. It's a novel with "teeth" because it's not simply boy meets girl, boy falls for girl, couple ride off into the sunset. Instead, it's a story about two folks who have to face down their fears and past mistakes - in order to move forward with a future relationship. On the scale of one to five, I give this novel a solid three. If you are looking for a fun read that has a western twist, give it a try.